Srinagar, Dec 05 (Agencies): National Conference on Wednesday held commemorative functions to mark the 113th Birth Anniversary of Sher-e-Kashmir Sheikh Muhammad Abdullah across the State. The main congregational Fateha Khwani was held at Qaid Mazaar at Naseem Bagh in Srinagar. 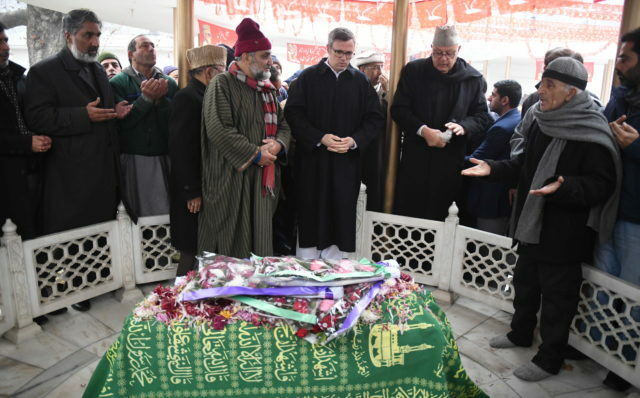 Party president Dr. Farooq Abdullah and vice president Omar Abdullah led the senior party leaders and party functionaries along with hundreds of party activists in paying tributes to Sher-e-Kashmir at Qaid Mazar, Naseem Bagh Srinagar. The observance proceedings started with the recitation of the holy Quran followed by congregational Fateha Khawani. Various religious personalities had gathered there to pay tributes to Sher-e-Kashmir. On the occasion, National Conference President Dr. Farooq Abdullah said Sher-e-Kashmir’s legacy of struggles for the identity and the dignity of the state and its people provides a guiding light for not just the party but the people of Jammu and Kashmir as a whole. “The best tribute to Sher-e-Kashmir would be to leave no stone unturned to fight for the honour and dignity of our people who have suffered immensely due to various political machinations, instability and turmoil,” Dr. Farooq Abdullah said. National Conference Vice President Omar Abdullah while paying glowing tributes to Sher-e-Kashmir said that the party is committed to nurture his legacy of secular thinking and inclusive approach for one and all. “The party continues to follow the path laid down by Sher-e-Kashmir which is to protect the identity and dignity of J&K and its people against forces hell-bent to divide us on the basis of religion, region and language,” the party Vice President said. Senior party leaders, functionaries and party workers participated in the congregational Fateha Khwani and paid glowing tributes to Sher-e-Kashmir. and special prayers and `Fateha Khwani’ was also held . The Party’s District president for Ramban Sajjad Shaheen along with the Party functionaries and prominent workers with large number of activists participated in the `Fateha Khwani’ and paid glowing tributes to the Party founder. While addressing the gathering National Conference District president Sajjad Shaheen said, Sher-e-Kashmir’s legacy of unimaginable struggles for the dignity of his people provides a guiding light for not just the party but the people of Jammu and Kashmir as a whole. “In Sher-e-Kashmir’s legacy we find answers to many challenges that we are faced with today, including a challenge to our special status and unique political identity. The best tribute to `Sher-e-Kashmir’ would be to leave no stone unturned to fight for the honour and dignity of our people who have suffered immensely due to various political machinations, instability and turmoil”, Shaheen said.